First Listen: Afi Scruggs funks it up on "Love Walked Out"
“Love Walked Out (Blues Walked In).” If that’s not the name of a blues song, then I don’t know what is. But if listeners expect to hear something along the line of something from Muddy Waters or even a southern soul legend such as Denise LaSalle, they’re going to be surprised. Pleasantly surprised because Afi Scruggs, a Cleveland-based bassist and singer/songwriter endows a piece of 1980s funk with blues sensibility. Scruggs grew up in Nashville, and although Music City, U.S.A. is known as the home of the Grand Ole Opry and country music, Scruggs heard plenty of blues when her mother played the music of Bobby ‘Blue’ Bland and B.B. King, among others. Before heading north Scruggs worked as a reporter in Mississippi where she got deeper into the blues because of stories told in the songs. 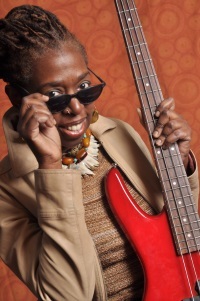 So, Scruggs had the blues down, and moving to Ohio where she connected with Michael J. Calhoun, founding member of The Dazz Band allowed her to add some funk to the mix. Calhoun co-wrote “Love Walked Out, (Blues Walked In)” and SoulTracks presents the fruits of the blues/funk mashup on this First Listen. Check it out. Afi Scruggs - "Love Walked Out (and the Blues Walked In)"